Merely a month after the fire that kills 3,000 high-end top quality snakes in a reptile facility in Colorado, now there is another heart breaking loss in Ohio. R.I.P. to the 50 magnificent animals killed. 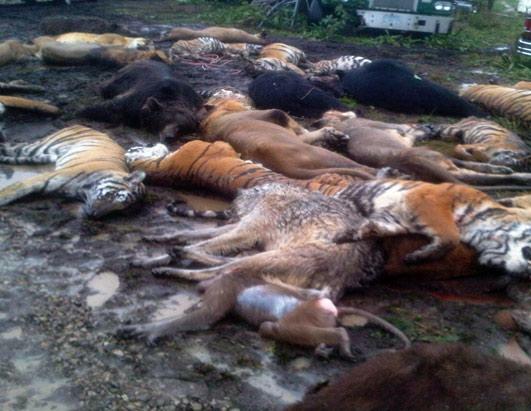 18 highly endangered Bengal tigers, 17 lions, grizzly bears, gray wolf, mountain lions, chimpanzees, a baboon and more were shot to death by the Sheriff’s deputies of Zanesville, Ohio on Wednesday after the owner of an exotic farm threw their cages open and committed suicide. The media and Animal rights advocates are mostly aiming at the state regulations of dangerous exotics possession but my first question was why would they have to kill them all instead of trying to bring them down with tranquilizers? It is well understood that their job is to ensure public safety and for the deputies tranquilizer darts are not as easy to practice as shooting to death like big game. So I would not say it is a fault, but there were better options. At least they should not have shot the monkeys. Carrying disease does not sound like a good enough reason to me to kill them immediately. Anyways there seems not much the police can do. Those animals are infamously built for the ability of taking out a human, although the possibility of them killing someone is in fact very low. The tragedy in Ohio was sad but the holocaust was somehow unblamable. But right here in Hong Kong there have been many animals being killed unnecessarily. The wild animals in here considered dangerous are mostly snakes. We do have native venomous snakes in here but in fact they are way less dangerous to people than what they are known for. I have often seen tiny little snakes being smashed to death in order to “ensure public safety” but many times those were non-venomous. Another times there were issues of wild boars attacking people then authorities allowed legal hunting. They can attack but after all they are just pigs. They don’t kill people. Most times the authorities like to tackle problems and avoid responsibilities the easiest way for them but that is definitely the worst way. In a metropolis like Hong Kong, animals would never like to attack humans until they are forced to. Killing only generates hate. Killing endangered animals is even the worst sin that no one is able to compensate.